Insecure writer’s support group is brought to you by TheNinja Captain: Alex, and this month’s co-hosts are M. Pax, Karen Walker, and Melissa Maygrove. 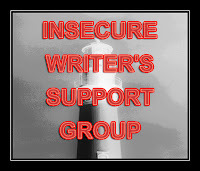 For those of you who don’t know about the IWSG, this is the time when creators around the world lend support, vent about the process, and generally release the bad so they can take in more good. It works about like the ancient scape goat method of tying your sins onto a goat and sending it out into the wilds (usually to be eaten, but sometimes to rise above the tyranny of predator/pray situations and become super goat). I’ll tell you a secret: I used to think you could edit all of the good out of a project. I used to believe that there was something magical about the first version of the words (and for some people, I’m sure there is, I’m just not one of them). I think I got this idea from the fact that early on, it was hard to convey what I wanted. On the rare occasions when I managed it in the first shot, I didn’t want to screw it up by messing around with it. As you can imagine, you get better at that part with time and volume of work. Eventually, you get to the point where you write a scene, then rewrite it from a different angle, then for grins you give it another shot and pick which one really captures the essence of that chapter (or if you’re like me, you’ll take pieces of each version and smash them together). For me, the realization that my very first attempt at something isn’t magical has been, well, a big deal. It also means a lot more rewriting than I’d hoped to be putting in. Now, every time I think a project is done, someone points something out, and I have to go back through and revise for some little detail (or worse some big detail). On the other hand, I wasn’t very good at playing Mario in the first levels, so maybe I needed to work my way up to the big castle at the end. When I look back at those other bloggers who “made it” and they wrote about how they spent years spinning their wheels trying to figure out how to make it work, I realize that was the map. You have to find your own way, and all the bumps are part of the road. More than ever, I see why people quit. More than ever, I see I’m not going to stop anytime soon. I hope I’m getting close to the castle with the princess. In the mean time, I think I’ll have some mushroom soup. What about you? Did you stick the landing on the first go round, or did you need a few practice castles to get there? Or maybe you're like me, swimming in mushrooms. LOL! Rena, you crack me up. I've always LOVED editing, which is a dangerous thing--because I could do it forever and be happy. Granted, I think I've found my princess. She's waving from the distance and I just have to wade through the moat of final revisions to get there. Ha! I've never played Mario, but I'm pretty sure I'm swimming in mushrooms like you! This! Yes. "You have to find your own way, and all the bumps are part of the road. More than ever, I see why people quit. More than ever, I see I’m not going to stop anytime soon." And I totally relate to the feeling of disillusionment when I realized that I was going to have to rewrite. That's when I started hiding everything I wrote, because it wasn't 'good enough' to show people. Ugh. I used to think the same thing, that I'd captured something magical with my first draft. For me, there's definitely a fine line between perfect and over-edited... but I can now spot it. The rewriting is torture, isn't it? But I'm starting to realize it's the best way to really tell a story. I never would have considered myself a pantser before I began my first book, but I'm now realizing, I kind of was. Whether you do the work upfront and right extremely detailed outlines, or work off of general outlines and rewrite several times, you have to do the work. I do think there's something to Natalie Goldberg's concept of 'first words' being the strongest and closest to your heart, but I also think that the more you write, the better your first words might become. And I heartily agree that learning to edit well is the best skill a writer can acquire. I remember looking at my first draft, and several drafts after that, wondering just what to start editing to make it better. I just didn't know where to start! Finally, I'm beginning to see what needs fixing, and with the help of some detailed critiques learning how to approach fixing it. I'm always glad when I read that you're not quitting anytime soon. Your books are going to be fantastic! Love this post! It made me think of a conversation I had with my family about Lord of the Rings. Why didn't Gandolf just call the giant birds in the beginning? They could have all flown to Mordor, dropped the ring from above and gone home. No one would have died, end of story. So many practice castles, I could start selling imaginary real estate. I think getting over my belief that if I had any talent, I could do one draft and be done was causing me way too much stress. agh! sounds like a time to test my patience! Oh yeah. I've been there. Took me year to even find the story I could finish. And then more years to write it. More to edit. And one more to find my publisher. you definitely have to build up to it. you have to be ready for the work and reviews and promoting... level up!! now we have candy crush with no goal except to get to the next level! I'm still working on those practice castles. So far it's all been one huge journey learning what I don't know. Going on five years now. Hopefully there will be a light at the end of the tunnel soon.